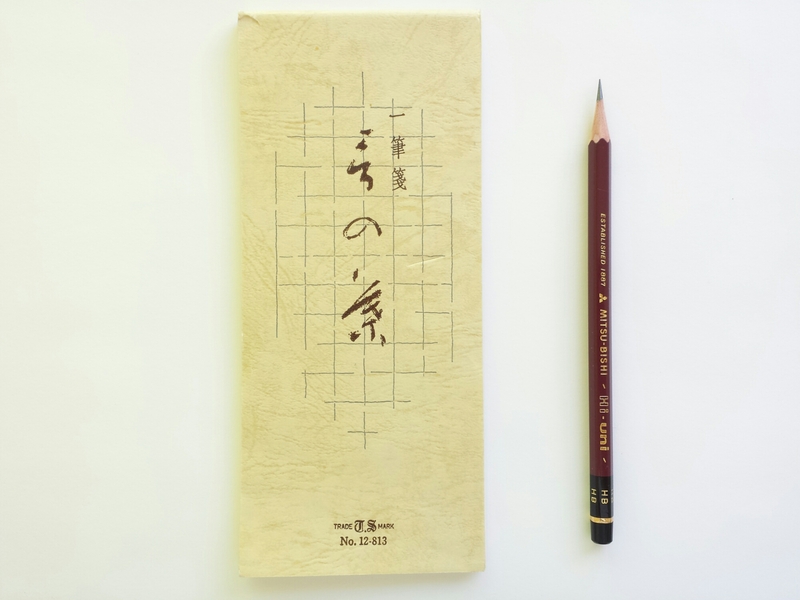 “Ippitsu-sen (一筆箋)” refers to a Japanese type of letter-writing pad of a specific size, of around 18 cm by 8 cm, often with guidelines to facilitate vertical or horizontal writing. I picked some up a long time ago, without even realizing what it was, and it was only recently that I learned it had a name and a specific function. 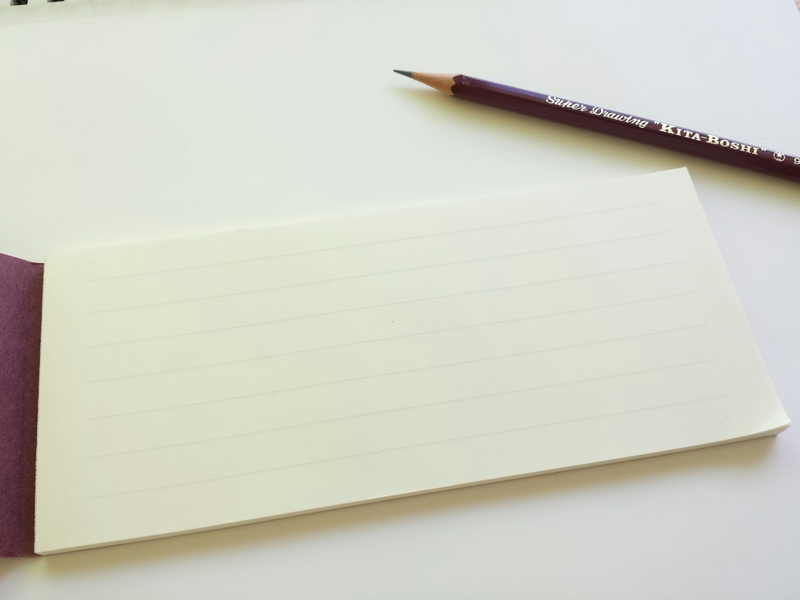 I think the name means “one-line paper,” as when we say, “Drop me a line.” It probably corresponds to the Western greeting card (especially those smaller, unadorned ones that use thinner paper), but this is lighter, more ethereal, somehow less formal. 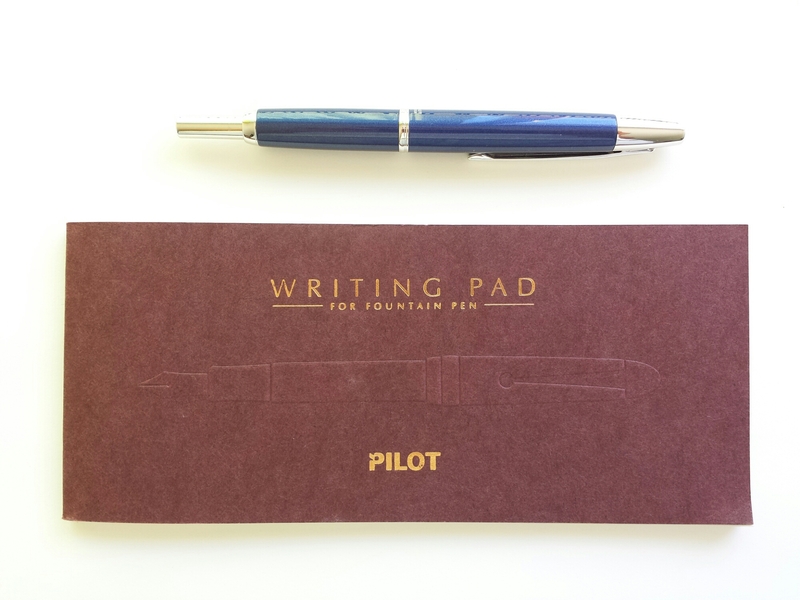 This straddles the delicate middle ground between a card and a full-sized letter writing sheet. Ippitsu-sen is meant for short messages, usually accompanying a gift, small souvenirs, business papers or samples, or things being returned to the original owner. You know, for those occasions when it’s just more polite to attach a note. 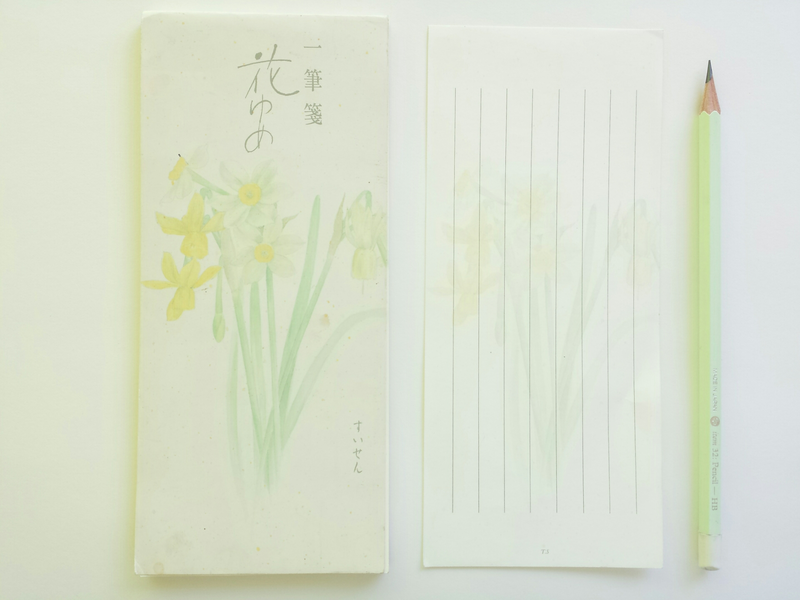 The stationery firm Midori has a tutorial page on how to write ippitsu-sen, and it turns out that there is actually very little space to write down anything personal, because opening greetings take up one line, closing greetings another(“I hope for your favorable consideration,” etc. ), and that’s already two lines out of a possible three or four – which probably comes as a relief for people who have to write them. So while the format seems casual (I don’t think it even needs an envelope), the content can be pretty formulaic. Anyway, the one below is my favorite, because the loose square guidelines mean it can be used either vertically or horizontally. I was amused to find that Tsuchihashi-san had the same notepad in his article introducing ippitsu-sen for men (read non-flowery). 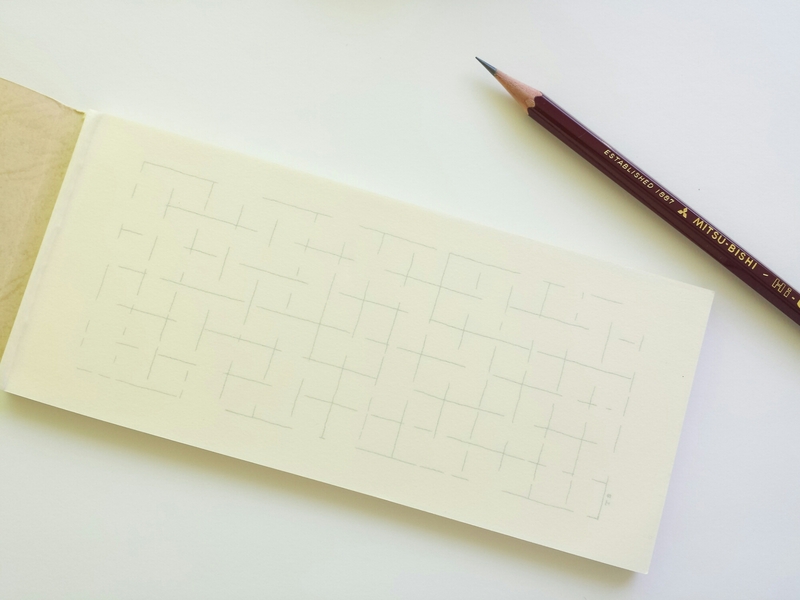 The square grid is also evocative of manuscript pads used by writers and journalists in both Japan and Korea (I’m curious whether the Chinese use them too). One square holds one letter, punctuation mark, or space. It’s been quite some time since the process was digitized and people started writing on computers and word processors, but industry people still refer to the length of an article by the number of 200-letter manuscript sheets it takes up (“word count” being a very Western concept). And this would be the stereotypical ippitsu-sen, with flowery illustrations and vertical lines. I think my mother bought this. It seems like the vast majority of ippitsu-sen users are women, and it can be hard to find something neutral and muted. I’m definitely going to add more to my collection if I have the chance. Thanks for teaching us about these ‘treasures’. I have seen similar looking paper for practising writing, but not for message writing. 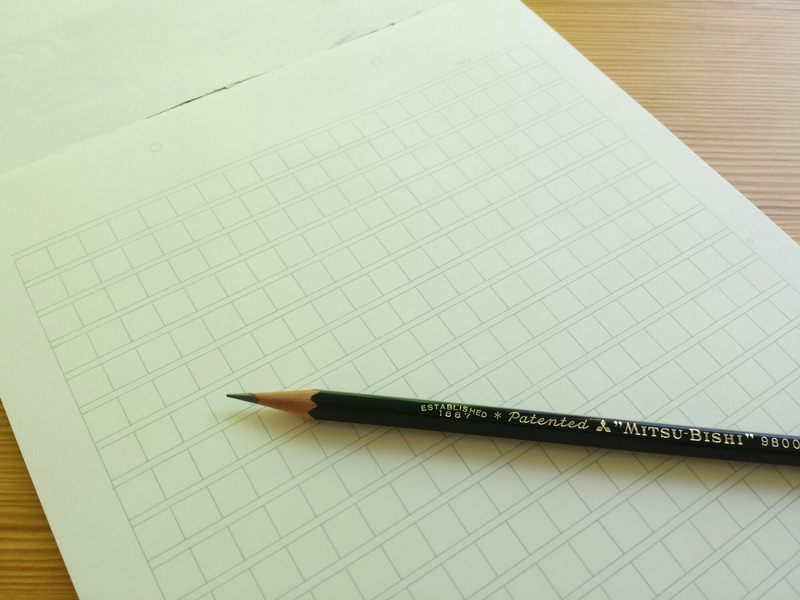 In the second picture, is the ‘incompleteness’ of the grids on purpose? Is there a meaning to the pattern? 아… 그리고 요즘은 어떤지 모르겠지만 근대 중국인들도 원고지를 사용했습니다. 상하이에 있는 루쉰 기념관에 가면 육필 원고를 볼 수 있다고 합니다. 간단하게 메모하기 좋아서 이 형식의 패드를 많이 샀었는데 쓰는 법까지 있었다니 제가 무지했습니다. ^^ 어떻게 쓰는건지 언제 천천히 읽어봐야겠습니다.